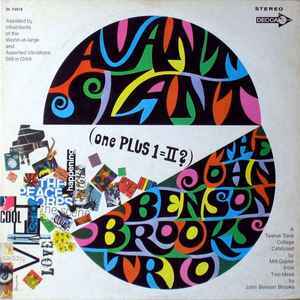 a twelve tone collage by U.S. Jazz-trio assisted by inhabitants of the world at large, and assorted vibrations still in orbit... such words are found for the actors also performing on this album; John Clellon Holmes, the Beat-writer of fame, states in the liner-notes to this album: "Avant slant is a collage-in-sound, in which fragments of poetry, pop tunes, radio broadcasts and Feiffer-like babble intermingle to form an aural history of "Right Now". It is also a twelve-tone Jazz concert... an electronic poem composed in several media, and the first example of what may be a radically new art-form. it resulted from a unique collaboration between a creative artist and a technical wizard. the artist is John Benson Brooks, composer, arranger, pianist and philosopher.The wizard and catalyst is Milt Gabler, without whom the the library of recorded music in America would be woefully, even irreperably smaller, as his biography makes all too clear. Possibly the first, or one of the first, ever 'sampling' records. In between segments of free-ish jazz you get excerpts from various pop, blues and spoken-word beat poetry albums. Quite an intriguing listen. The original songs, sung by Judy Scott, are quite dated... but actually rather fun.... 'Love Is Psychedelic' especially is very much of its time but most enjoyable. Some of the poetry clips like LeRoi Jones 'Black Dada Nihilismus' make me want to hear more. I got this album for about 50p around 1978 and have held onto it over the years despite many collection culls. Get your stripey t-shirt out, the wraparound shades and light a 'jazz' cheroot... then put this album on daddy-o. It's a bit like being back in the '60s.